I still believe that the best sf debut of the 00 decade in the US has been the Golden Age Trilogy of John C. Wright and because of that I have always had a soft spot for the author despite that his follow-up novels veered towards urban fantasy (War of the Dreaming) and then YA fantasy (Chronicles of Chaos of which the first volume was somewhat interesting but I never got the urge to read more). Mr. Wright's detour in "classical" sf - Null A Continuum, sequel to one of the best golden age series of AE Van Vogt that has made me a lifelong sf fan - was a disaster as the author tried to imitate the dated prose of the 40's, but I shrugged and enjoyed some his more recent short length offerings that were superb, most notably The Far End of History, Judgement Eve or Murder in Metachronopolis. 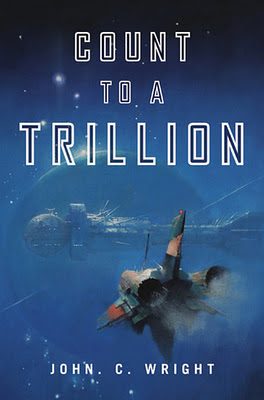 So when his new space opera series that starts with Count to a Trillion has been announced, I was very excited and I asked for a review copy as soon as I could. To my surprise the novel turned out to be a major disappointment and for the same reason I strongly disliked Null A Continuum, though this one at least has updated sfnal content, so it is readable. "Hundreds of years in the future, after the collapse of the Western world, young Menelaus Illation Montrose grows up in what was once Texas as a gunslinging duelist for hire. But Montrose is also a mathematical genius—and a romantic who dreams of a future in which humanity rises from the ashes to take its place among the stars. The chance to help usher in that future comes when Montrose is recruited for a manned interstellar mission to investigate an artifact of alien origin. Known as the Monument, the artifact is inscribed with data so complex, only a posthuman mind can decipher it. So Montrose does the unthinkable: he injects himself with a dangerous biochemical drug designed to boost his already formidable intellect to superhuman intelligence. It drives him mad.Nearly two centuries later, his sanity restored, Montrose is awakened from cryo-suspension with no memory of his posthuman actions, to find Earth transformed in strange and disturbing ways, and learns that the Monument still carries a secret he must decode—one that will define humanity’s true future in the universe." The author tries to marry the pulp sf conventions - throw in concept after concept in a madcap non-stop action with no depth both in world building and characters, no particular bother to understand or explore human relationships beyond the surface - with modern high grade sf and it simply does not work since the book is way too self-serious for its style and way too silly in style for its content so to speak. The novel abounds with moments where despite its supposed world encompassing milieu, it reads like something set on a bare stage with one or two participants that have delusions of grandeur. There is very little sense of the external world outside Menelaus and his friend/arch-nemesis and the declamations of both hero and villain simply sound ridiculous. 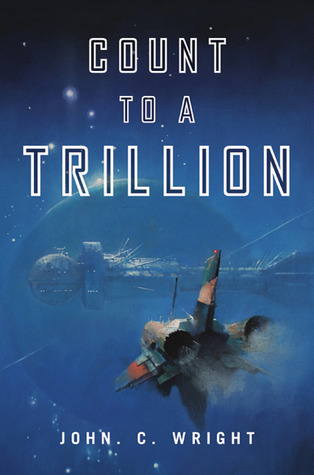 Not to speak of the math gibberish that annoyed me here and there but again I wouldn't mind such in a "fasten your seat belt and join the ride fun novel" that does not take itself too seriously, but I mind in sf that tries to get at Reynolds or Egan levels in content. The ending is quite dramatic and a cliffhanger offering some hope that the series will improve, so I may just check the next installment to see if that is the case, but it will be far from the priority of this one. 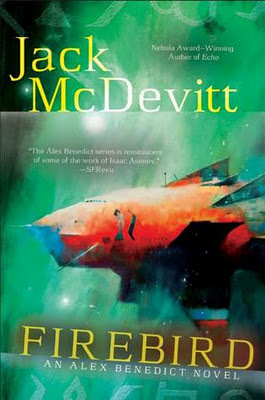 Since I have read A Talent for War in the early 90's I have been a big Jack McDevitt fan and his subsequent novels mostly worked out very well for me with the Academy series being a huge highlight opened by the superb The Engines of God which alongside A Talent for War still ranks in my highly recommended list of A++ sf novels. So when Mr. McDevitt returned to the world of Alex Benedict and Chase Kolpath in Polaris, I was quite apprehensive as the mysterious far future of A Talent for War did not quite seem suitable for too much exploration. Still in Polaris, Seeker and The Devil's Eye (FBC Rv) the superb storytelling skills of the author managed to suspend my disbelief in an universe that while set some 10 thousand years in the future, looked not unlike the homogenous middle class US of the 50's with a few - but not that many either - new gadgets around. A sort of retro future sf which I heartily dislike in general as I think it has had its expiration date a long time ago. When the author turned his hand to a light but ultra-fun time travel story in Time Travelers Never Die (FBC Rv), I hoped that Alex and Chase have been retired at the top, but it was not to be and last year's Echo just brought my suspension of disbelief to a crash in a novel that while readable - again as a testimony to how mesmerizing the author can be - was utterly laughable in world building from beginning to almost the end. So this year's Firebird has been a very low expectation novel for me but I opened it and this time the story took over from maybe page 50 on and I turned the pages and enjoyed it till the end. There are the usual McDevitt touches - Alex and Chase investigating, the blind alleys, the mysterious enemies, the stunning discovery - but this time the big picture of the universe is involved and it works much better than in Echo; the ending made me hope that Firebird is the last novel in this series since the author is way too good a storyteller not to have a better and more up-to-date tale to regale us with. Firebird is the best Alex Benedict novel yet and it just goes to show that as good a writer as Jack McDevitt is (see my review of Time Travelers Never Die), he keeps getting better. This novel presses all of my science fiction buttons: it's got a fascinating mystery, big cosmological events, black holes, lost spaceships, artificial intelligence. While the story itself, told as always from Chase's point of view, focuses on the mystery, it can't help but reveal new facets to characters I have grown to think of as friends. At times, the tension is high between Alex and Chase and we get a glimpse of how they came together in the first place. We also learn more about the AIs in this distant future, and the subject of the novel allows for intriguing discussions of philosophical questions: religion, intelligence, and what it means to be sentient. "A sort of retro future sf which I heartily dislike in general as I think it has had its expiration date a long time ago." I sincerely hope that is not the case, not only because I enjoy a good retro future sf tale, but because I think good writers can write good stories regardless of the style of sf, etc that they write and I still think there is a place for the kind of story that has been done before just as much as there is for those that try to do something new and inventive. @Carl - I think maybe we have different definition of retro-future; I like what some refer "space cadet" stories IF they are set in a universe that is believable (eg not a monocolor Anglo America of the 50's) and if they are written in an adult style not in the " age of sf is 12" style of the 30-50's. Then, yes, I'm with you all the way there. I think there are some authors who can capture the "feel" of that older pulp style while making the story engaging for a contemporary audience. I'm even more disappointed to read the issues you had with it because I love the John Harris cover.